Safety is our most important duty and responsibility. We never take it for granted. Providing a safe, injury-free work environment for all people, whether on the jobsite or in the office, is an operating principle we live by. 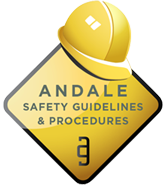 Andale Group strives to continually improve our standards with a stringent commitment for ongoing education, pre-planning, job specific safety analysis plans, and accountability, from every construction team member. We are thorough in identifying potential risks while enforcing safety guidelines which ensure that our safety policies are met. This history of in a successful results within our firm’s history of project developments, drives home our safety message to all of our business units, subcontractors, partners, and project staff. The safer we are, the more successful the projects will be . . . for all involved.